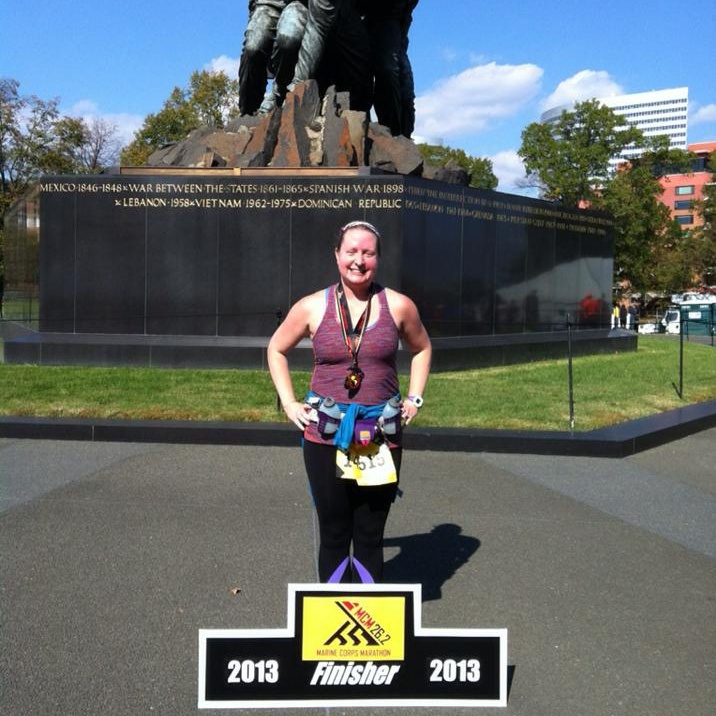 Runners Inspiring Runners – Katy C. | So What? I run. It’s funny, but I knew of Katy long before I actually met Katy. We had a mutual friend so I would hear about her and sometimes see her in passing at races. When we finally met, I liked her in an instant. I love her perseverance and her unrelenting determination. I was so impressed and SO PROUD when she knocked of 41 minutes off of her personal marathon best in one training season! 41 MINUTES!!!! Unbelievable! How can you not be inspired by that?! I knew instantly she was an inspiring runner and I had to include her in my RIR series. Check out our interview below. SWIR – When did you decide to make healthy changes in your lifestyle? Katy – I started attempting to run and go to the gym in 2002 like most brides a year before their wedding. I was not really serious about running until later, but I loved going to spin class and yoga for years before that! SWIR – When did you start running and why? Did someone or something inspire you, if so what or who? Katy – I started running more than one mile in the winter of 2009. My friend Taryn encouraged me and another friend to train virtually with her for a 5 mile race in DC. That got me over that one mile hump. I ran a 10K and some 5Ks that summer and fall. The summer of 2010, a good friend of mine passed away after a prolonged battle with Leukemia. I wanted to do something to honor her memory, but I didn’t really know what I wanted to do. The Charm City Run (CCR) had just opened in Clarksville and they had an info session for the Maryland Half Marathon and fundraising for the Marlene and Stewart Greenbaum Cancer Center at the University of Maryland. I was scared to fundraise and take my running to the next level, but the coaching and people I met at CCR made it a wonderful experience. SWIR – Tell me about your first race. How did you feel after you crossed the finish line? Katy – My first race was the Clydes 10K in Columbia in the spring of 2010. I missed my first 5 miler with Taryn because of a minor car accident injury. I felt like the hills would never end! But, it felt amazing when I finished even though my back was killing me. And it was great to see my husband there cheering me on (he would join me running a few years later). Looking back on those first few races I ran, they felt a little lonely. I trained by myself and I didn’t know any other runners at the time. But, everyone seemed like they were having fun, so I kept going. SWIR – I know you tried the Hanson method this year. Why did you decide to switch it up? How did the training go and would you consider it a success? Would you do it again? Katy – It was actually pretty random! I was tired of miles 20-26.2 defeating me. My friend randomly liked the Facebook page for the book. I was surprised to discover an entire running section at the library this summer and found the Hansons Book there. I read it and it made so much sense to me. Hansons focuses on running many miles over 6 days a week in order to train your body to run on tired legs. They say they are training you for the last 16 miles of the marathon, not the first 16. There are easy running days, and “something of substance runs”. These are your tempo, long runs, and track workouts. I ran double the weekly mileage I had been running for my last two marathon training seasons. At first, I was worried about the sheer amount of distance you run each week, but it wasn’t as difficult as I thought it would be. The Hansons Method was a complete success for me. Before, I wasn’t taking easy days and I kept getting hurt during each training season (nothing too serious, but I usually had to take a week off each time). It took the pressure off weekend long runs because I became more comfortable running longer distances on a daily basis. It was also good to vary the speed of my runs. I feel like it made me a stronger, more confident runner. I finished Marine Corps 41 minutes faster than my previous PR. And I only felt tired at mile 23, not completely defeated, which was a first. The only downside to Hansons was I was following the plan mostly by myself. Luckily, I had good friends who ran with me many times during the week in the morning and would run the various speed and strength track workouts with me. I don’t think I could have gotten through all of those workouts without them! I would recommend trying Hansons with a training partner. I always felt badly saying “Tuesday we will run 8 miles” when maybe there were 4 miles on my friends’ plans. SWIR – Is there a particular distance that you are aiming for or have you found your favorite distance and are sticking do it? Katy – I just like racing. I enjoy running through different cities. My favorite distance is the half marathon because it’s challenging, but you can recover quickly. Although nothing will beat that marathon finish feeling. However, I think I’m built for about one full marathon a year. I love racing, and seeing everyone finish. The distance doesn’t matter. SWIR – Do you cross train? If so, what else do you do and how often? Do you switch it up if you’re training for a specific race? Katy – I am really bad about cross training. The winter of 2013, I went to bootcamp and took a break from high weekly mileage. It turned out to be really good for me. But, when I’m training for a marathon, I’m usually concentrating on getting out there to run. (and with Hansons that’s an hour or more every day). I’m going to try to be better about this in 2014! SWIR – What about nutrition? Did that change when you started running? Katy – My nutrition has changed slightly in that I can’t really eat a bunch of junk all the time, especially before long running days. I eat much better in the spring, summer, and fall when my family’s garden and my community garden plot are in full swing. I eat mostly a vegetarian diet, but I also love my cheese and the occasional burger. SWIR – What’s the most challenging part of running? Katy – The most challenging part is getting out the door. If I can just get out of bed or off the couch and get out the door, I’m good to go. SWIR – How do you get through the really tough runs when you can’t find your motivation or your body just isn’t cooperating? Katy – I think about when I was told I couldn’t run when I was 12 because I had exercise-induced asthma, and how I proved him wrong. I was also lucky I somewhat outgrew my asthma, but I still use an inhaler before I run. I think about how lucky I am to be able to run. And that it’s nice to be outside during all of the seasons (this is especially helpful on very hot days). If all else fails, I walk for a bit and just try to stay centered. SWIR – Do you train with groups or by yourself? Katy – A little bit of both. I really love my alone time, but running has increasingly become my time to catch up with all my wonderful friends! SWIR – Have you ever bonked during a race or a training run? If so, how did you get through it? Katy – Is there a runner who has not bonked during a race or training run? If so, I would like to meet this person! I am very good at bonking. Sometimes, there are tears. When a run gets overwhelming, I just give myself a minute, and think “one foot in front of the other” or “smile and relax” and when all else fails, I count. But there have been some pretty spectacular bonks. Luckily, I have only had to leave a race once, the 2012 CCR 20 miler when I got really dehydrated because it was so hot and humid. SWIR – What nutrition do you use during your runs? Katy – During my runs, my new favorite are the Powerbar performance energy blasts in lemon and orange. Or as I call them, fancy nutrition gummies. I used to also use the cliff blocks which I also liked. I also take electrolyte pills if I need them or drink Nuun or Gatorade in the warmer months. SWIR – What’s your typical pre-race meal? Katy – Pasta or baked chicken with mashed potatoes and veggies the night before. I don’t like to eat a lot before I run on race day. Before a marathon, I’ll get up 2.5 hours ahead of time and eat a banana and some peanut butter on bread. Before a long run, I like to eat one or two honey stinger waffles and a gel with caffeine. Typically the Hammer Espresso or more recently the Gu Salted Caramels! SWIR – What’s your favorite post-race meal? Katy – Immediately following a race, I don’t really eat much at all. I like to drink a Hammer Chocolate Recoverite and sometimes I can eat a banana or cold watermelon. But a few hours later, I love to eat pizza or (sadly) a McDonalds Fish Filet and fries. SWIR – Do you listen to music when you run? If so, what’s your go to song or songs? Katy – I only listen to music if I’m running on the treadmill. There are so many distractions in life, running outside is one of the only times everything is just quiet. But, if I am stuck inside, my go to music is Sleater-Kinney, Le Tigre, Les Savy Fav, LCD Soundsystem, and Gnarls Barkley. Probably not your typical workout tunes, but Corin Tucker’s voice motivates me. SWIR – What is your most favorite piece of running gear? Katy – That is such a difficult question as I am a running gear addict! I would say my Lululemon Pacesetter Skirt, Under Armour Frosty Tights, and Sweatybands. SWIR – How has running changed your life? Katy – This answer is difficult to put into words. It has given me focus and pushed me in ways I never did as a younger person. I was that cynical girl walking the track in high school for a 20 minute mile because I thought it was stupid. It has changed me in ways I would have never imagined when I printed out my first training plan four winters ago. I have also met fantastic, generous, smart people I otherwise would have not known. I can’t imagine them not being in my life now. This entry was posted in Runners Inspiring Runners and tagged Charm City Run, Hanson Method, Inspirational stories, Motivation, Runners Inspiring Runners by SoWhatIRun. Bookmark the permalink.